• World premiere: Dec. 1991, studio 104 of the Maison de Radio France, Paris (France), during the Forum des orgues d'Île-de-France – organ students of the Conservatoire à rayonnement régional of Boulogne-Billancourt. • Commissioned by the French ministère de la Culture and the Forum des orgues d'Île-de-France. • CD “Organs d’Île-de-France, vol. I” (Chamade 5620). 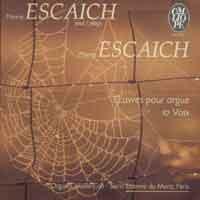 • CD “Escaich joue Escaich” (works for voices & organ) (Calliope 9937). • CD “Esquisses” (Calliope 1205). The Cinq Versets sur le «Victimæ paschali» (Five Verses on the 'Victimæ paschali'), written for a classical or a symphonic instrument, were composed in 1991 at the request of the French Ministry of Culture for the Forum des Orgues d’Île-de-France. They consist of a series of five short variations on the Easter sequence Victimæ paschali laudes (To the Easter victim), each creating its own very distinctive world. A rhythmic variation on the theme, characterized by unsettled writing (based on syncopations or added values). Like most of the variations in this cycle, the verse evolves like a short symphonic poem, with a progression in several stages, a climax and a swift fall, in which we witness the gradual elimination of the rhythmic theme. A very tensely expressive Adagio, evolving in the form of a slow chromatic ascent, written contrapuntally, to a climax in the form of a cry, suddenly emerging into a coda reduced to the bare essentials. The Gregorian motive reappears only weakly, in fragments, punctuated with rests. A short intermezzo in which the humour of the beginning is soon opposed by more exciting recollections of the previous variation. As in many of my pieces (the middle movement of the First Concerto for organ and orchestra, for example), this is a long processional march, combining two elements: a slow ostinato march on the motif from Victimæ paschali on the one hand, and a completely broken, de-structured presentation of the same theme on the other. The atmosphere thus grows heavier and heavier, becoming almost overwhelming, sometimes punctuated with ‘flashes’ in the form of sudden bursts of chords. A brief toccata with constantly irregular meters, occasionally attempting to return to the more exciting expression and phrasing of the previous verses.